Some time ago Scale 75 released their Metal n'Alchemy Steel Series Paint Set which included Alchemy paints. Alchemy paints? What is this sorcery you may ask - and your questions is justified! I own a looooot of different paints (not meaning that's it has sense - or is neccessary :D ), I love to experiment and if I see a new brand I just have to get some bottles to see how they behave. You noticed this in the past in articles as Black is the new Black or the Metallic Color Comparison Chart. We also recently got the complete range of P3 paints to try out and I will report about my experiences with those paints. As I said, I love to experiment with new stuff! Ok, back to topic: Alchemy paints. How to describe those paints? Somehow metallic, somehow not. Kind of shiny and very, very fine pigment. You can mix them with normal colors to get interesting effects. 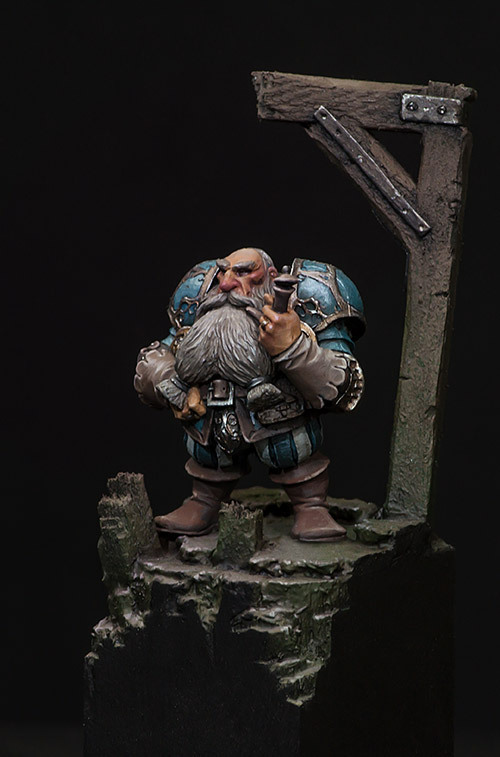 I tried to paint a Dwarf ( Yurgen Bad Pipe - Enigma Massive Darkness ) using Alchemy paints in my mixes. Especially in the armor, beard and skin. Wonderful work, marvellously painted and detailed. I´ll be eagerly waiting for something you consider really fancy... ;) Greetings! I really like them, i may have to try a few through the airbursh. So are like that crystal line from mig, almost a metallic wash i guess, sort of translucent. Experiment suggestion: The Matt strikes Black. Do the black tests again, but add Scale75, Marabu Decormatt Acryl and use some kind of stick as base, so you can swap and compare any two. And maybe effects of varnish, like the ArmyPainter antishine one (the bottle) or Talens 115, covering different segments of each stick. Thanks. I guess that with the experiments in hair and skin, you are trying to recreate natural surface shine, like the classic "metallic band" in advestisment of hair products.